Mark your calendars! 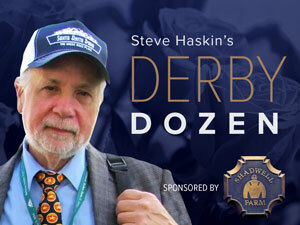 On Friday March 29th, Richmond area racing fans will have a chance to meet national racing writer Steve Haskin, whose weekly “Derby Dozen” articles highlight the top 12 three-year-old horses racing as they battle for a spot in the Churchill Downs starting gate the first Saturday in May. Mr. Haskin will appear at Breakers Sports Grille OTB in Henrico from 4-5 PM and at the Ponies & Pints OTB in downtown Richmond from 6-7 PM. Take advantage of this great opportunity — to chat about the following day’s Florida Derby card and the Kentucky Derby! Talk Derby with a national handicapper and writer — whether it is the Kentucky Derby, the next day’s Florida Derby or Dubai World Cup (both on Saturday March 30). Mr. Haskin will be distributing free Florida Derby race programs to all horseplayers.